These Football Games Shocked Red Bull Fans! 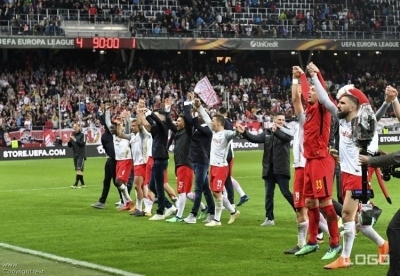 The Europa League‘s final four clubs have been determined, and Red Bull supporters are probably puzzled as to how they will take the results of their football bets! Meanwhile, Arsenal and Atletico Madrid are doing just fine with their respective football games. They will definitely be favoured by betting websites once the semi-finals have been determined. Fans knew that Marseille would play very determined football to overcome the young Red Bulls, but few expected things to end up like this. Bruma scored within the first five minutes of the game, building on their 1-0 lead in the first leg. However, strikes from Bouna Sarr and Florian Thauvin, as well as an own goal from Stefan Ilsanker, saw the visitors looking at a one-goal deficit. Jean-Kevin Augustin quickly levelled the game, but Dimitri Payet and Hiroki Sakai put the game away for Marseille. It was a brilliant win for the Phocians, and the manner of their victory will be talked about by fans for years. Arsenal only needed a draw to secure their win, but Wenger’s lads almost threw it all away. Fedor Chalov and Kirill Nababkin put the hosts back in the map with their respective goals, threatening to make a huge upset. However, Mohamed Elneny saved the day for the Gunners. He made two vital assists that helped Danny Welbeck and Aaron Ramsey to seal the game late. Wenger would definitely want to see more consistency from his defenders, but his attackers are somewhat doing a great job for him. Just like the Gunners, Atletico Madrid only had to defend to secure their victory. However, Sporting made sure that their victory won’t be handed to them easily. The Lions made life a lot tougher for Jan Oblak, who had to pull off several amazing saves. Fredy Montero put the hosts within striking distance after a poor Oblak deflection allowed for him to make an easy header in front of goal. The rest of the game saw beautiful, coordinated attacks by Sporting and Atletico Madrid. Both defences had their fair share of action as they tried to one-up the other. This is the most dramatic victory witnessed at this stage of the competition, be it the Europa or the Champions League. Salzburg were heavy underdogs coming into the match, and Ciro Immobile’s 55th-minute strike made it seem like the Austrian Red Bulls will be eliminated from the competition. However, that’s when the magical run happened. Mu’nas Dabbur opened the floodgates with a brilliant strike amongst Lazio shirts. A howitzer from Amadou Haidara, a perfect blitz from Hwang Hee-Chan, and a brilliant header by Stefan Lainer completed the most improbable comeback of the tournament.